It was the culmination of ten years of increasingly violent unrest between supporters of King Henry VI and his cousin Richard, Duke of York. 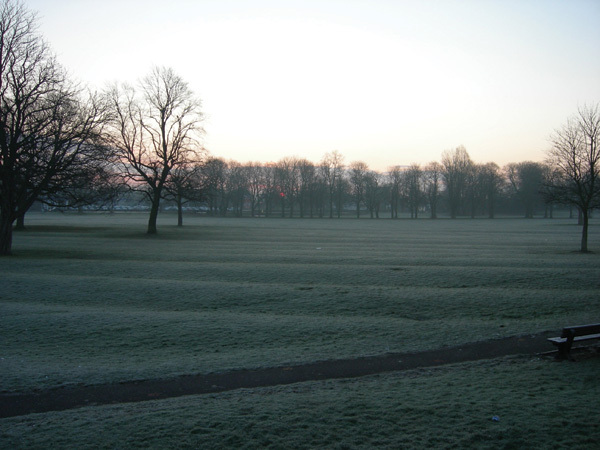 Helen Cox takes us on a battlefield tour of Wakefield. In October 1460, the exasperated Duke finally pressed his own claim to the throne and was recognised as heir-apparent – whereupon Henry’s resolute Queen, Margaret of Anjou, immediately called on Lancastrian loyalists to restore the succession to their son Edward, Prince of Wales. Her supporters duly harassed the Duke’s northern estates to draw him away from his power-base in London, and around 21 December, an opening skirmish was fought at Worksop between outriders of the armies converging on Yorkshire. 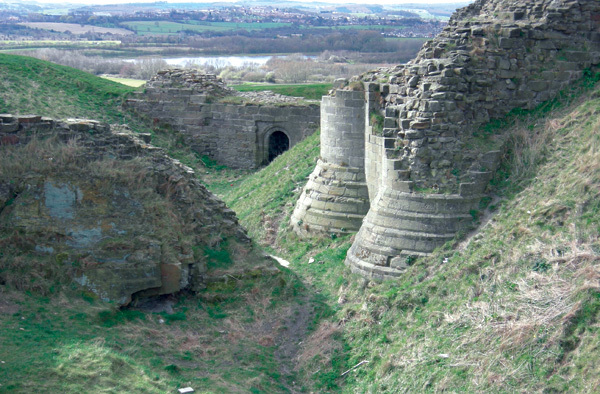 The Yorkists spent Christmas 1460 at Sandal Castle near Wakefield with an estimated 5,000 to 6,000 men, and the Lancastrians, with perhaps twice that number, nine miles away at Pontefract Castle. During a brief festive truce, the Duke granted a commission of array to one of his in-laws, John, Lord Neville, to recruit on his behalf; he may also have received a pledge of support from an erstwhile Yorkist ally Sir Andrew Trollope, a veteran commander in Calais. On Tuesday, 30 December 1460, the Lancastrians marched to Wakefield and deployed on a low hill just south of the city, separated from Sandal Castle by a mile of arable fields and rough common. York’s army, swelled by a substantial muster newly arrived with Lord Neville, sallied forth to meet them – but their confident expectations of victory were soon to prove misplaced. Contemporary details of troop deployments and the course of battle are scarce, but the armies would typically have been arranged in three ‘wards’: the main (centre), van (right) and rear (left). The Yorkist wards may have been led by their three senior peers, the Duke himself, his second son Edmund, Earl of Rutland, and their ally Richard Neville, Earl of Salisbury. Facing them were Henry Beaufort, Duke of Somerset; James Butler, Earl of Wiltshire; John, Lord Clifford of Craven; and numerous other magnates including Henry Percy, Earl of Northumberland, and Henry Holland, Duke of Exeter (York’s embittered son-in-law). Hostilities may have begun when, on a pre-arranged signal, several hundred of Trollope’s men launched a surprise attack on their supposed allies. With panic and disorder sown in the Yorkist ranks, battle proper was joined. Then, with York’s army fully engaged, their enemies’ carefully-laid battle-plan was revealed: John Neville’s contingent entered the fray – on the Lancastrian side. Within the moment of an hour (according to the Tudor historian’s account Three Books of Polydore Vergil’s English History, Sir H Ellis [ed.] Camden Society) it was over. Hopelessly outnumbered, Richard of York attempted a fighting retreat but was overcome and killed not far from Sandal Castle. Other desperate troops broke north for the shelter of the city, only to be cut down in the bottle-neck killing field enclosed by a loop of the River Calder, now known as Fall Ings. Among them was Edmund of Rutland, who was overtaken and slain by Lord Clifford near Wakefield Bridge. Up to 2,000 Yorkists died on the field for the loss of only 200 Lancastrians, while some prominent figures, including the Earl of Salisbury, were captured and beheaded at Pontefract the following day. Castle’s relatively small confines. Looking north-west, you can trace the line of the Calder running towards Wakefield, and see the ‘island’ of Fall Ings just south of the city – on a clear day you may also spot the chantry chapel on the Medieval bridge. And half a mile north-east of the castle, a green field bounded by trees marks the site of York’s demise – of which you’ll get a better view on foot. 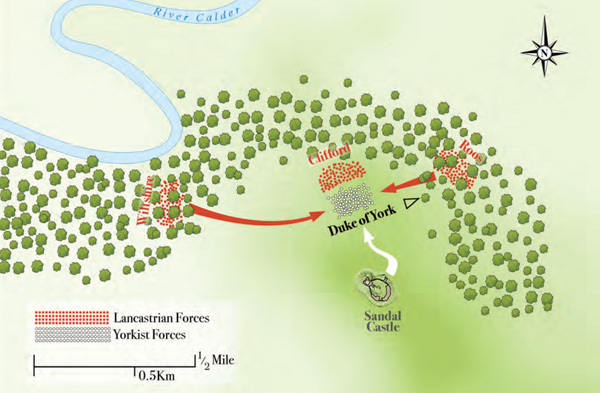 Leave Sandal Castle and follow Manygates Lane – the same route the Yorkists took to battle in 1460. In less than half a mile, you will reach the remnant of Wakefield Green, now called Castle Grove Park – a well-preserved field of Medieval ridgeand- furrow which would have seen fierce hand-to-hand combat as the Duke strove vainly to reach the safety of his fortress. His Victorian monument stands opposite, among school railings, moved from its original position closer to where he died (slightly further north by the junction of Manygates and Milnthorpe Lanes) when the site was built on. Walking on towards Wakefield you pass the Portobello estate, where human bones and weapon fragments (all since lost) were unearthed in the 19th century. Turning left from Manygates Lane onto the A61 Barnsley Road takes you gently uphill to the Lancastrian opening position, corresponding with the present Bromley Mount. Just beyond is Fall Ings, the site of the main Yorkist rout, and, finally, ahead on the right, the bridge and Chantry Chapel of St Mary the Virgin, where Edmund of Rutland is popularly thought to have died. Others believe the Earl’s flight took him further north along Kirkgate into the city proper, and that he was killed near a building called the Six Chimneys. Unfortunately this collapsed in 1941, but its location and name are preserved in the modern building erected on the same site. This article featured in issue 4 of Military History Monthly (formerly Military Times).